Hygge is something I really found charming when visiting Norway. And if you haven’t heard of it, basically it’s a Noridic way of brining in a mood of coziness, comfort, wellness, and contentment. Think of a cozy well-made bed, layered with fluffy comforters, and the sweet warm scent of a vanilla candle while relaxing with tea. It’s a designing style that turns your room into a restful and inviting place during cold weather. And as you know I love sharing tips and tricks to make your life a bit easier, and that’s why today I decided to gather some awesome ideas that will instantly bring hygge to your room. These are designing hacks that are all budget-friendly, not complicated, and will make your room look amazing. So check them out! One of the easiest ways to bring hygge into your room is by adding some adorable and comfy rugs. Nordic sheep skin (faux) rugs are a great example! It makes for a nice place to put your feet on and an opportunity to add a soft texture to your floor. Layer up your bed with a soft, comfortable, and stylish cable knit throw blanket which will easily add a cozy ambiance to your room. You’ll absolutely love this especially in the frigid winter or chilly spring. With a cream clean-lined shade designed to add a warm glow, a floor lamp will easily bring an elegant style and cozy ambiance to your room. Put it near your bed or shelves to brighten up your space. In hygge design, you never want to use just one blanket. 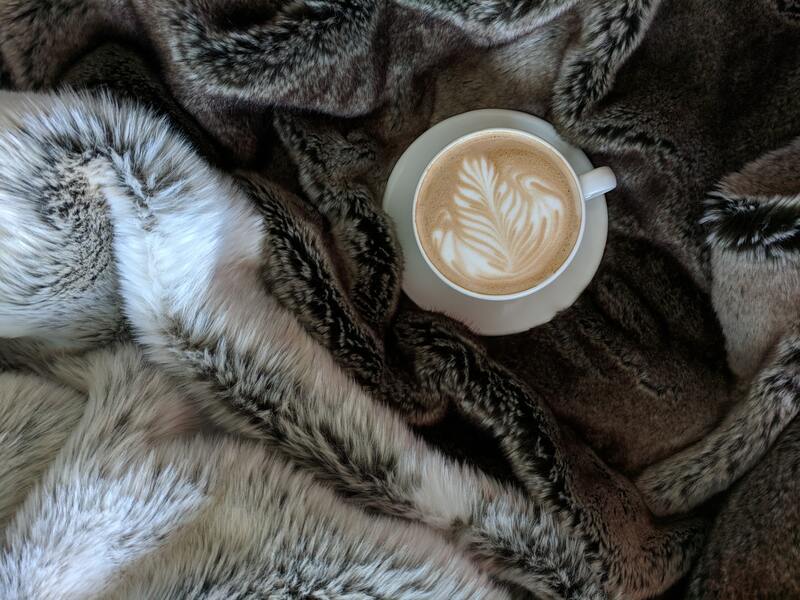 Pile them on and create your own layering style by adding a super soft and chic faux fur throw blanket. Nothing is more cuddly and warm than soft cozy pillows. So try some cable knit pillows made from cotton materials and make a warm space for yourself on the couch. One of the easiest ways to add instant hygge to your room is by adding and lighting some scented candles. And if you’re wondering what kind you should get, then definitely check out some soy candles that give off the scent of a fir tree forest or another warming scent. A good book is an essential element of hygge. So try creating your own reading nook filled with cozy furnishings and candles. To add a little magic and coziness to your room, try to hang some strung lights behind a sheet or thin curtain above your bed. Make a relaxing experience in your room by adding a chic looking diffuser. Add some lavender essential oil before bedtime for its aromatherapy which will help soothe your anxiety and restlessness. Stone, natural fibers, and wood are all ideal for bringing hygge into any room. So get a wooden bowl, fill with pinecones, and place it on your side table. Now, what’s your favorite hack to add hygge to your room? Let me know in the comment down below, I’d love to hear about them!